Students at North Rockford Middle School will soon be seeing a new member of the school counseling department and she will belong to the whole school. Chillie, a 3-year old yellow Labrador retriever, will be the district’s first School Counseling Dog and a welcome presence at NRMS. 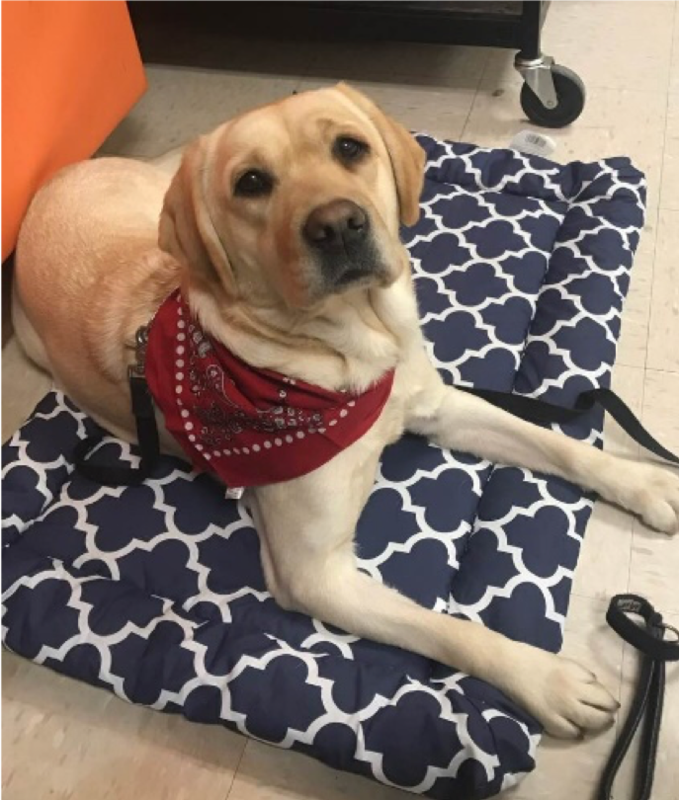 Chillie was a service dog for a local agency and is making a career change to spend her time with students and staff at North. This opportunity could not have been possible without the support of partnerships. The Rockford Education Foundation (REF) provided the funding to acquire and train the dog. Additional partnerships include Rogue Valley Veterinary Hospital and our local Chow Hound. In addition to providing professional canine advice, Rogue Valley Veterinary Hospital will also provide veterinary care and preventative maintenance. The local Chow Hound is providing the food and bathing for Chillie. In addition, Interquest Detection Canines will continue to partner with RPS to provide support, recertifications for Chillie, and staff training. Kim Heys of Interquest Detection Canines has worked with RPS for over 15 years and has been training dogs for detection and counseling work. In addition to Chillie’s service dog experience, she has also been trained to be a counseling assistance dog in a school setting. Counseling Office Appointments: Students may sign up during their lunchtime, before school, or by reading during Connect. Classroom Visits (where there are no allergies to a dog’s presence). Reward Systems, Small Groups, Individual Counseling Sessions, and more. Chillie will begin her new career at North Rockford Middle School on May 1, 2019.